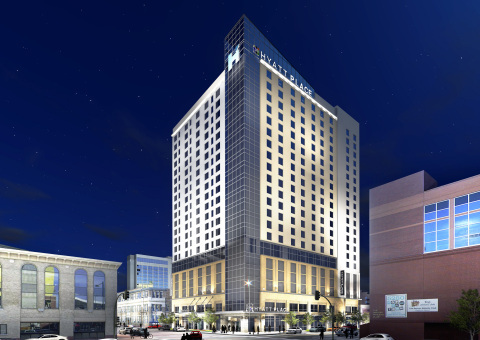 CHICAGO--(BUSINESS WIRE)-- Today, the dual-branded Hyatt Place Denver/Downtown and Hyatt House Denver/Downtown open, which mark the first combined Hyatt Place and Hyatt House hotels in the Denver area. The hotels create an experience that offers guests two different hotel experiences under one roof in one great location. Hyatt Place Denver/Downtown is the perfect choice for the tech-savvy traveler, thanks to the brand’s intuitive design, casual atmosphere and modern conveniences, such as free Wi-Fi access with seamless connectivity and 24-hour food options. Hyatt House Denver/Downtown offers a residentially inspired, extended stay experience, combining the service and ease of hotel living with the spaces and places that help make guests feel more at home. The pairing of these two urban hotels makes this 361-room property one of the top 10 largest hotel locations in the downtown Denver area. Hyatt Place Denver/Downtown and Hyatt House Denver/Downtown infuse Colorado-influenced design throughout the hotels with a blend of mountainous themes and Denver-centric elements – from recycled beetle kill wood accents and handcrafted local artwork in a regionalized lobby, to Colorado craft brews on tap and on-demand amenities inspired by the Centennial State’s infectious spirit. The hotels’ interiors bring nature indoors with artwork and décor that symbolizes the brisk mountain peaks and the airy valleys that Colorado natives call home. Denver is a city that loves and values its visual arts; not only do Hyatt Place Denver/Downtown and Hyatt House Denver/Downtown fit right in, they were built to stand out. Designed by Simeone Deary Design Group (SDDG) with local art activation through Forse Art Consulting, the hotels’ shared lobby features art installations from celebrated Denver talent, Sabin Aell, among others. Highlighted art pieces include a large Sabin Aell mural, covering a nine-foot wall in the Hyatt Place Gallery, inspired by the organic flowing lines found in a topography map of Colorado. Located in booming Downtown Denver, where business, culture and microbreweries intersect, the hotels are a short walk from the Colorado Convention Center, as well as some of the Mile High City’s most popular attractions, including Denver Pavilions, Denver Center for Performing Arts, and the Denver Art Museum. Hyatt Place/Hyatt House Denver/Downtown is under the leadership of General Manager Chad Cuddy, and Director of Sales Annebeth Black. In his role, Cuddy is directly responsible for managing the day-to-day operations of the hotels, including overseeing the hotels’ nearly 100 associates and ensuring guests encounter the thoughtful service for which Hyatt Place and Hyatt House hotels are known. Black is responsible for providing sales service and support to travelers and meeting planners frequenting the Denver area. Hyatt Place, a brand of Hyatt Hotels Corporation, offers more than 230 locations in the United States, Armenia, China, Costa Rica, India, Mexico, Morocco, Puerto Rico, The Netherlands, and United Arab Emirates. For Hyatt Place information or to make a reservation, call 1-888-HYATT-HP (888-492-8847) or visit hyattplace.com. White Lodging Services Corporation was established in 1985 and is headquartered in Merrillville, Ind. White Lodging is a fully integrated hotel ownership, development and operations company focused on developing and operating premium-branded hotels in growing urban markets across the United States. The company is a recognized leader that has defined and cultivated the ability to achieve consistent, sustainable growth among mid- to large-scale hotels. Its current portfolio consists of more than 160 hotels in 20 states and encompasses representation of the following leading brands: Marriott International, Inc., Hilton Worldwide, Hyatt Global, Starwood Hotels and Resorts, Preferred Hotel Group and InterContinental Hotel Group. For more information about White Lodging, please visit www.whitelodging.com.